Last updated 12/31/2008 by David Giblin. Publication: Herb. Raf. 76. 1833. Notes: Goodyera oblongifolia and G. repens are likely the parents of the allotetraploid G. tesselata (Kallunki 1976, 1981, 2002). Earlier checklist reports of Goodyera repens from WA are in error. FNA26: "In eastern North America, Goodyera oblongifolia is restricted to formerly glaciated areas. 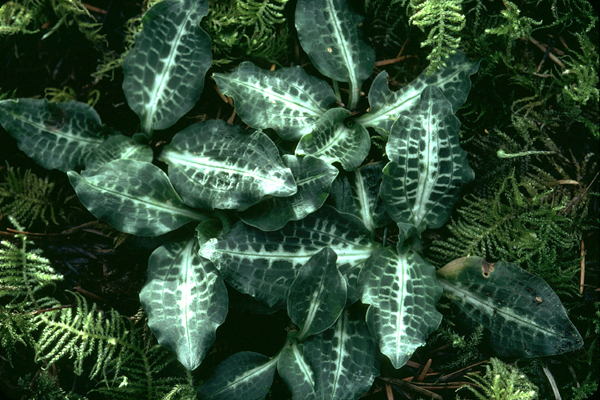 Plants with leaves white-reticulate on the lateral veins have been described as Goodyera oblongifolia var. reticulata. This segregate, essentially coastal in distribution, occurs from northern California to southeastern Alaska and is less frequent inland from British Columbia to New Mexico and in Michigan and Wisconsin. Because garden transplant experiments (J. A. Calder and R. L. Taylor 1968, vol. 1) have shown that both reticulate and non-reticulate leaves are found within the same clone, varieties are not recognized." » Kallunki, J. A. 1976. Population studies in Goodyera (Orchidaceae) with emphasis on the hybrid origin of G. tesselata. Brittonia 28: 53-75. » Kallunki, J. A. 1981. Reproductive biology of mixed-species populations of Goodyera (Orchidaceae) in northern Michigan. Brittonia 33: 137-155. » Kallunki, J. A. 2002. Goodyera, pp. 514-517, In: Flora of North America Editorial Comittee, eds. 2002. Flora of North America North of Mexico, Volume 26, Magnoliophyta: Liliidae: Liliales and Orchidales. New York and Oxford.